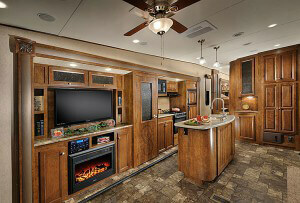 Over the years, the name Coachmen has become synonymous with the epitome of quality recreational vehicles. From Class A motor homes to versatile fifth wheel trailers, Coachmen has been created some of the most trusted and talked about RVs available on the market. Amongst their wide range of reliable vehicles, the 2014 Coachmen Chaparral stands strong as one of the most promising vehicles in their fleet. We here at Phillips RV, your leading Illinois RV dealership, are excited for the opportunity to offer our customers the chance to check out great models like the new Coachmen Chaparral on our lot. If you'd like to learn more about pricing and availability, please feel free to give us a ring at 815-933-2251. For over a decade, the Chaparral model has been the fifth wheel flagship for Coachmen Recreational Vehicles, embodying everything that the brand stands for in terms of creating quality-assured, reliable, and comfortable recreational vehicles. The new 2014 Chaparral comes completely loaded with a ton of great features that the whole family is sure to love. Thanks to the wide variety of great interior features available, 2014 Chaparral owners and their families can enjoy all the comforts of home no matter where their adventure takes them. Amongst the many features offered with the new Chaparral, shoppers will love the maple cabinets, brushed nickel hardware, jumbo booth dinette with pedestal table, AM/FM/CD/DVD player with MP3 hook-up, cable TV/satellite hook up, queen sized bed, full bath, a large pantry, full kitchen, and much more. The great thing about having a fifth wheel recreational vehicle is that as long as you have a tow worthy vehicle, you can bring your RV wherever the road might take you, even if it is slightly off the beaten path. Couple this with ample interior room, a large cargo and towing capacity, and more than enough space for water and waste storage and you have a vehicle thatâ€™s perfect for a weekend getaway to a month long road trip. We here at Phillips RV would like to invite all our Chicago, Indiana, and Illinois shoppers to swing by our IL RV dealership and see what the new 2014 Chaparral has to offer in person. If you'd like to learn more about our dealership and the different types of models we have for sale, please feel free to give us a call at 815-933-2251.